Musical Instruments – Online | Skinner Auction 2670T | Skinner Inc. Highlights from violins to be offered include instruments originating in New England: a violin made in 1933 labeled “Robert Holt, Belfast, ME” (lot 43, estimated from $300 to $500) and another from 1878 by Calvin Baker of Boston (lot 90, $2,000 to $2,400). French violins include an instrument from the Lorraine School, circa 1840 (lot 107, $1,500 to $2,000), and a signed Jenny Bailly violin, numbered 135, from 1920 (lot 45, $400 to $600). A John Juzek violin, circa 1966 (lot 91, $500 to $700), and a Steglio Maglia violin (lot 68, $600 to $800) will also be offered. A German viola from 1973 by Anton Schroetter (lot 88, $600 to $800) and a 2002 one-half-size German cello by Clement and Weise (lot 127, $300 to $400), accompanied by a certificate will also be available. Guitar offerings include a Gibson Epiphone electric guitar, serial number SJ03091627 (lot 106, $200 to $300), and an American guitar by the Kay Musical Instrument Company of Chicago, model P3, serial number L 5587, H.K.G. Proceeds from the sale of this instrument (lot 102, $100 to $200) will be donated to the Boston One Fund. A Brescian mandolin by Gioffredo Rinaldi (lot 278, $600 to $800), a mandolin by The Gibson-Mandolin Guitar Company, Kalamazoo (lot 272, $300 to $500), a four string tenor banjo (lot 104, $300 to $500), and a four string Vega professional tenor banjo, serial #85798 (lot 103, $200 to $300) will also be auctioned. A selection of clarinets includes two Selmer clarinets: a B-flat clarinet, CL300 with its case (lot 99, $80 to $100) and another from grenadilla wood, circa 1930, with the original case (lot 270, $100 to $200). A vintage Borgani soprano saxophone, made in Italy, keyed to F, with flat metal resonators (lot 275, $500 to $700) will also be available. The inaugural Musical Instruments – Online auction will take place from September 18, 2013 at 12:00 p.m. through September 26, 2013 at 6:00 p.m. Eastern time. Participants must create an account on the Skinner website in order to bid. For questions, contact the department at 508-970-3135 or music@skinnerinc.com. Previews for the auction will be held on Wednesday, September 18, 2013, 12 p.m.-5 p.m. and Thursday, September 19, 2013, 12 p.m.-7 p.m.
A virtual catalog for #2670T can be viewed here: http://issuu.com/skinnerinc/docs/2670t?e=1175486/4713978. The Skinner Fine Musical Instruments department deals in fine and high-quality bowed and fretted stringed instruments, primarily through public auction, as well as through private sale and online-only auction. Skinner auctions of Fine Musical Instruments, held twice annually in the spring and fall, routinely realize highly competitive prices. 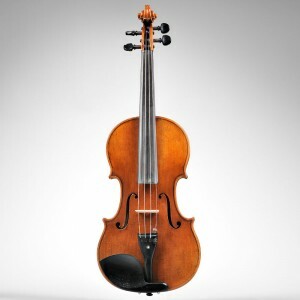 The department sold a fine and important Stradivarius violin, circa 1721, for $1.4 million, and a 1958 Gibson Explorer Electric Guitar for $611,000 – a world record at auction. This entry was posted in News and tagged auction, cello, gibson, guitar, martin, music, Musical Instruments, skinner, stringed instruments, viola, violin, violin bow by Skinner. Bookmark the permalink.